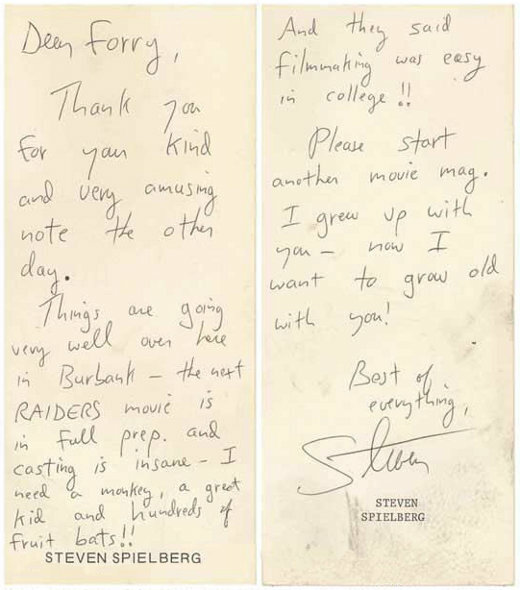 Early-1983: Steven Spielberg writes a short note to Forrest Ackerman — editor of film magazine Famous Monsters of Filmland — and speaks briefly of the "insane" casting process on Indiana Jones and the Temple of Doom. Thank you for your kind and very amusing note the other day. Things are going very well over here in Burbank — the next RAIDERS movie is in full prep. and casting is insane — I need a monkey, a great kid and hundreds of fruit bats!! And they said filmmaking was easy in college!! Please start another movie mag. I grew up with you - now I want to grow old with you!